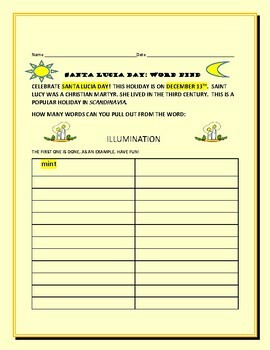 SANTA LUCIA DAY: WORD FIND ACTIVITY: HAVE FUN! This word find celebrates the Christian martyr, Saint Lucy. Students extrapolate words from the word, Illumination. She is the patron saint of the blind. Use this as a vocabulary activity, or for a lost prep. Use it when a student finishes an activity early, too. Have a wonderful day, on December 13th!